UC San Diego | Support the UCSD Dance Team! Support the UCSD Dance Team! The UCSD Dance Team is the official competitive dance team for UC San Diego. As a spirit group, team members have the opportunity to participate in a variety of school and community events throughout the year, such as Triton Mania, Sun God, and Spirit Night. The team also supports the athletic department by cheering and performing at basketball, volleyball, soccer, baseball, and water polo games, as well as other Triton Athletics events. Our team also prides itself on our community service initiatives. We volunteer throughout the year, and have been named the Most Philanthropic Sports Clubs Team for the past 3 years. In addition to these various campus and community service ventures, team members also have the opportunity to represent UC San Diego in national competitions. The UCSD Dance Team competes annually at UDA College Nationals in Orlando, Florida in both the jazz and pom categories. Although we come from different dance backgrounds, as a team we perform jazz, pom, lyrical and hip hop routines at basketball halftimes, community appearances, and campus events. We love being able to represent our school both on and off campus! As many of our friends and family know, dance is an expensive sport! Shoes, costumes, poms, uniforms, and team apparel add up quickly, and many of these items are paid for out-of-pocket by individual members. Currently, our team is also busy preparing for the Universal Dance Association’s National Dance Competition, which is often referred to as the “Olympics of Dance.” The competition is located at the ESPN Wide World of Sports Complex in Orlando, Florida, and increasing travel and registration costs every year have put a strain on our team. The high cost of this competition takes away our opportunity to travel to other competitions throughout the year, giving us just one chance to represent UC San Diego at the national level. We love attending UDA, and have consistently advanced to the finals every year. 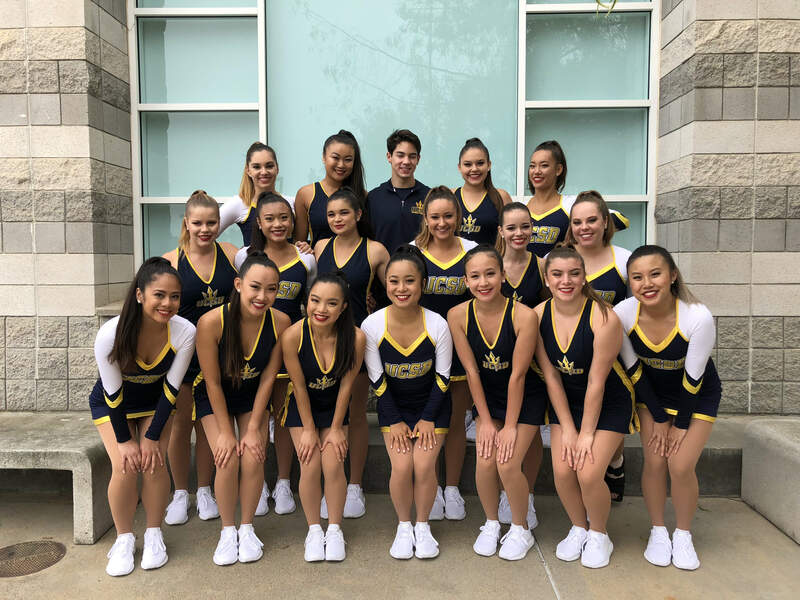 With UCSD’s upcoming transition to Division I athletics, our team is beyond excited to learn from other Division I teams at UDA, begin to participate in more campus athletics events, and become a stronger presence in the college dance world. We are extremely grateful for any and all help you can provide to help us continue our journey as a nationally ranked dance team. We are looking forward to new opportunities as we transition into Division I Athletics! UDA Nationals are scheduled for January 18th, 19th, and 20th! We would like to hit our goal in the next 4 weeks. How much do we want to raise? Any donations are greatly appreciated by our team, but our goal is to raise $8000. This covers the UDA participant package for the whole team, which includes competition registration, hotel accommodations, admission into ESPN Wide World of Sports Complex, ground transportation, and more! With competition expenses covered, we can utilize other team money to provide new shoes, costumes, poms, uniforms, and team apparel for us all. Give $50 and get a personal social media shoutout from the team! Give $100 and get a handwritten note from a team member! Give $250 and get a personalized postcard from us in Disney World when we compete! Give $500 or more and get the Dance Team Prize Package that will include Disney memorabilia, a signed team photo, and more!